The weather is getting colder and heading into winter. So on top of our sweaters and button-ups we can be adding coats and scarves. And of course, handbags. Because no outfit would be complete without a handbag, right? One of my favorite brands for leather goods is Fossil. My husband bought himself a Fossil ‘man’ bag this year for all his dental supplies to take to and from work and loves it. 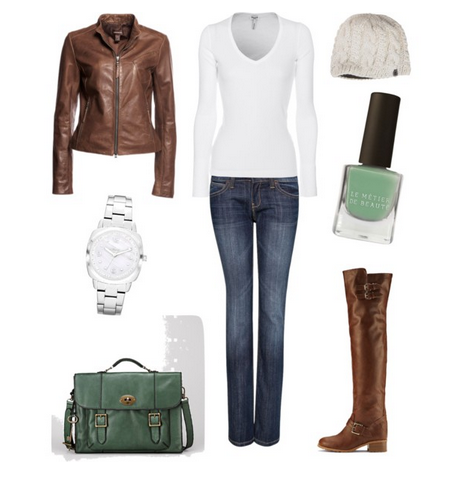 Here are a few winter-appropriate outfits that I designed on Polyvore completed with a Fossil Vintage Revival Handbags. So are you sold yet? Are you picturing yourself in these outfits holding your own Fossil leather handbag? Good. Because right after you enter the giveaway, you can win your very own Fossil Handbag! * All you have to do is create a pinboard on Pinterest with outfits you’d pair with your own Fossil Vintage Revival Handbag. Then leave the link to your board in a comment below. Make sure you include the hashtag #FossilVintageRevival in each pin in your board! *Winner will receive a Vintage Revival Small Flap Handbag. i can’t find the rafflecopter to enter!